I'll write this review in case it's useful to new and expecting parents out there. 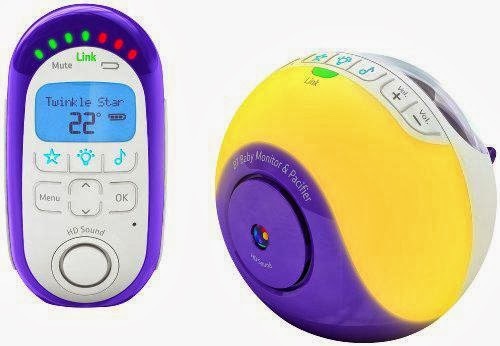 I did quite a lot of research before selecting what baby monitor to buy and I'm pleased I settled on the BT Digital Baby Monitor and Pacifier. I'll explain why. The market is saturated with baby monitors. It's an important purchase and you need to get it right, and there are loads of devices out there to suit anyone's budget. You can spend just over a tenner, or a grand, it's your choice. I didn't trust a gadget that was cheap so I opted to go for a mid-priced option. I knew that I wanted a monitor that would have plenty of features, and one that would last several years, where the features would prove useful over time. I also knew I didn't want a monitor with video playback because we were worried we might obsess over it otherwise, constantly checking on our little rascal while he tossed and turned or stuck his middle finger up at the camera. No, not for me thanks. So when I read reviews of this one I was immediately drawn to it because it also claimed to be a pacifier. Now anything that will pacify an unsettled baby at the push of a button has my attention immediately! The monitor offers the choice of giving them a light show, or playing music to soothe them - either a mix of soothing tunes that are built into the monitor, or you can go one step further by plugging in an iPod and selecting your own playlist. The other thing I liked about it is it claimed to have high definition sound, so I knew this was the one for me, and generally it had good reviews by other users - an average of four stars on Amazon based on 192 reviews. Our son is nearly seven months old now so I'll base this review on the time we've spent using it. But I imagine as he gets older that the device will take on different meanings and functions, as well as fulfilling its primary use of letting us hear him when he is distressed. Without further ado, here are my thoughts. HD sound. It's really crisp and clear, and I can hear every soiled nappy in horrific detail. I can also hear his breathing very clearly and choose different volumes depending on what I'm doing. Great signal. With a very strong wireless connection, it has never lost sync with the monitor and has a terrific range, the manufacturer claims it is 50m indoors and 300m outdoors. Sadly I don't have a mansion in the Cotswolds so can't test this theory, but I do believe it. Optional room temperature gauge / night light. Depending on what sort of parent you are, you can choose to use it as a really useful night light, similar to a Gro-egg. It will glow blue when it's cold, orange when it's an ok temperature, and red when it's too hot. This is a really useful feature actually. It's also useful for doing the dream feed, where I don't want to disturb him, but want just enough light to see that I'm not pouring the bottle in his eye. Useful talk back feature. At the push of a button on the handset, you can talk to their child, or give your partner a fright, depending on your needs. So far, I don't use this very often as I worry it could have a stimulating effect for him to hear my voice. However, I imagine it will really come into its own with older children who can talk, and I know a friend of mine often has midnight negotiation sessions with his daughter through the monitor! For the slightly more eccentric parents out there, you could also pretend to be the monster that lives under their bed, and frighten them into being quiet. But I'm sure Supernanny wouldn't recommend that. You can also check the room temperature on the handset. Wherever I am in the house, I have quick peace of mind as it tells me exactly how hot or cold it is. This is a well thought out feature, and remarkably useful as I don't think many other handsets give you a temperature reading despite it being one of the most obvious features a monitor should have. Pacifying music. If your baby is kicking off, just press the button on the handset and play them some soothing music. You can either play your own mp3's through an iPod, or the in-built songs. I do like the lullabies that it comes with. Instrumental versions of row your boat, twinkle twinkle little star, three blind mice, they're all there, all of the classics. But the most important thing is that it really does work and can settle him usually, so this is one of the most important features. It's worth mentioning I also turn on the music when I'm settling him for the night. You can customise how long you want it to play for, I have it on the 15 minute setting so quite often when I tiptoe out of his room I am reassured by the fact the music will probably work its magic and make sure he gets down to sleep. Torch on the handset. This is great for night time nappy changes as I put it on the end of the changing table facing away from my son and it provides enough light for me to see, without dazzling him. Likewise I use it every night when I'm doing the night feed, when creeping into his room. I'll then place it on the ground facing away from us when I'm bottle feeding him. The light isn't invasive but gives enough of a glow so I can see what's going on. It looks good - stylishly decorated in white and purple colours. I like the fact that it's rounded and has shelf appeal so it's like a decorative item in its own right. The light show is poorly thought out. It's bad for babies. Firstly, it has a stimulating effect, and he will coo and gurgle at the patterns on the ceiling when he sees them. But that's the last thing I want when I just want him to sleep, so I would advise BT that this is a good idea but needs refining. The other annoying thing about it is that the light show seems to be cheaply put together. The patterns are more like messy blotches, there aren't any shapes visible, it's a bit like a Jackson Pollock painting, but not a pretty one. We don't use this feature yet, but I imagine when he gets older he might like it on in the night, and if your child is scared of the dark then it could be useful, along with the night light. The re-chargeable battery life on the receiver could be longer - it needs charging every day, and on a few occasions if we've not charged it for long enough in advance it makes an annoying beeping noise. However this is a small quibble as it has only happened a few times and you just learn not to do it again. Overall review: 4 out of 5 stars. A very solid, versatile product, the BT Digital Baby Monitor and Pacifier gives you peace of mind, reliability and excellent features that I couldn't live without. Excellent value for money. In future this could easily be a five star product, it just needs a little more refinement and tweaking from BT. Price I paid: £65 on Amazon.